Jarred prepared tomato sauce in the stores just doesn't cut it for me anymore. Looking at the ingredients (sugar, preservatives, high amounts of sodium, etc.) and never quite getting the taste of the sauces I remember from when I was a kid is just pure frustration. As a result I've made sure that every summer I do my absolute best to grow decent tomatoes in my home garden. And this year has been by far the best yield yet. 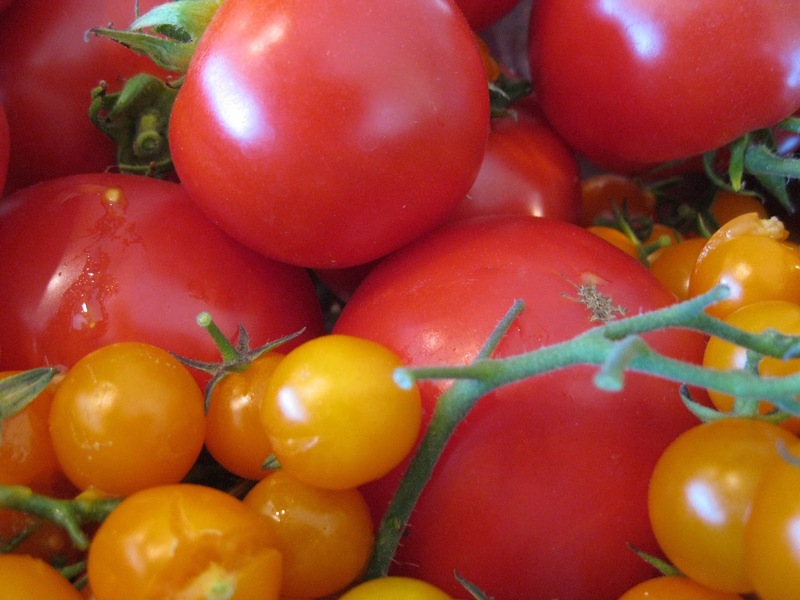 If you aren't lucky enough to have tomatoes to pick from the garden, fresh picked fruit is available from good farmer's markets just about anywhere this time of year. (Don't even think about using the gas-ripened, bland-tasting, mass-produced varieties found in a supermarket for this! Your shoes would taste better.) 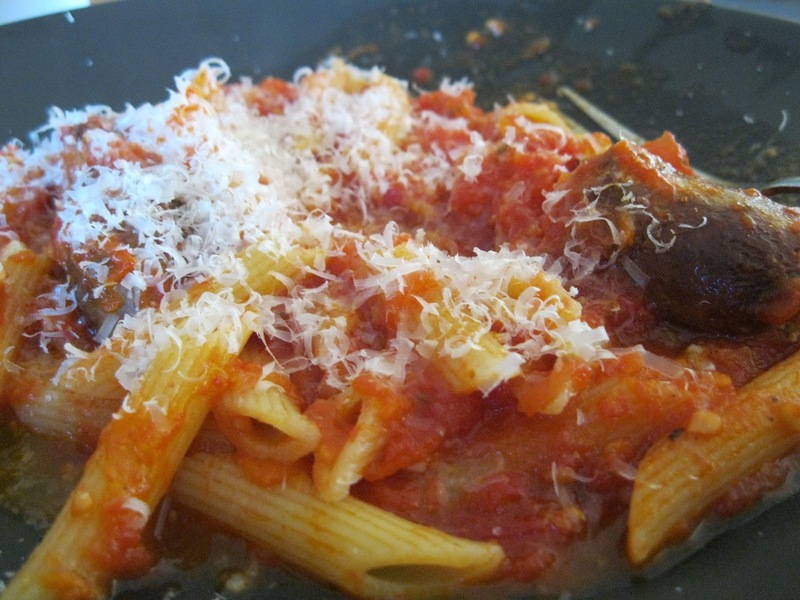 Try this very simple recipe with vine-ripened tomatoes and prepare to have your sox blown off. Once the fruit is parboiled and chilled in an ice bath, it should be a snap to peel. 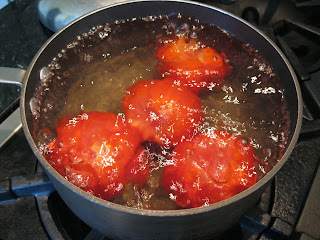 In a large pot, add water, put on a high heat and bring to a rolling boil. In a large bowl, add cold water along with plenty of ice cubes. 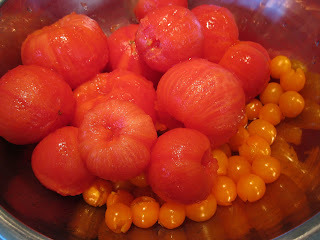 To prepare the tomatoes, core the stems out. 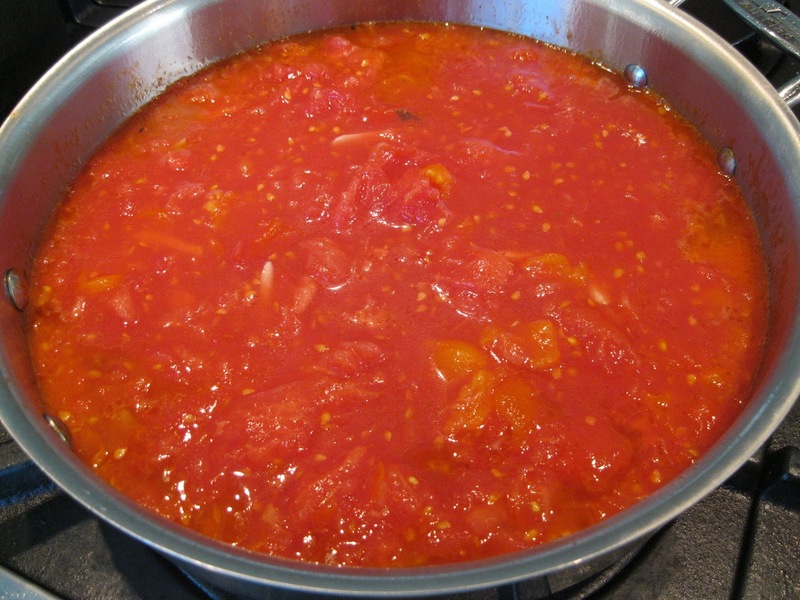 Drop several of the prepared tomatoes to the boiling water in batches to parboil for about 30-60 seconds. Remove the parboiled tomatoes with a slotted spoon to the bowl with the ice water, slip the peels off, then set them aside to another bowl. Handle the remaining tomatoes in batches. In addition to removing the peels, a lot of recipes also recommend removing the seeds. 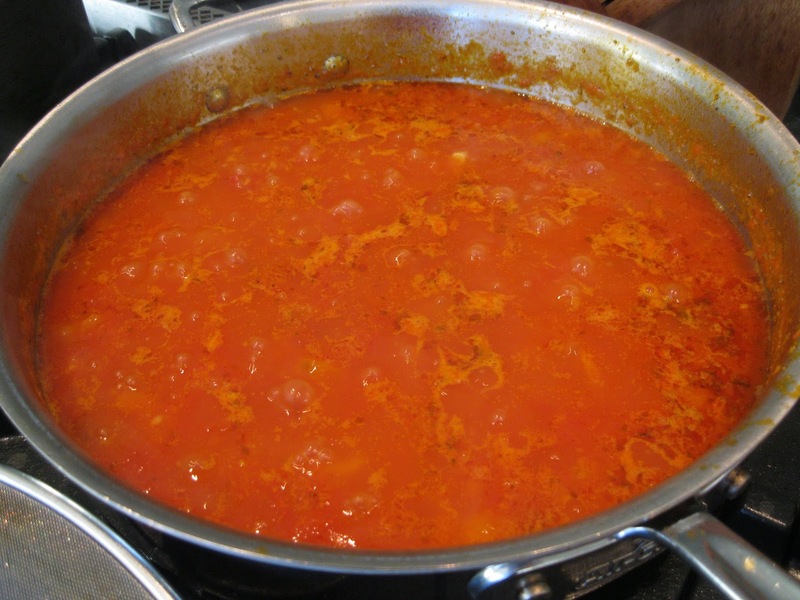 I tried doing so a couple of times when I was first learning to make sauce, but found it to be very time-consuming and cumbersome with no discernible effect on the overall results. As a result I no longer bother doing so. 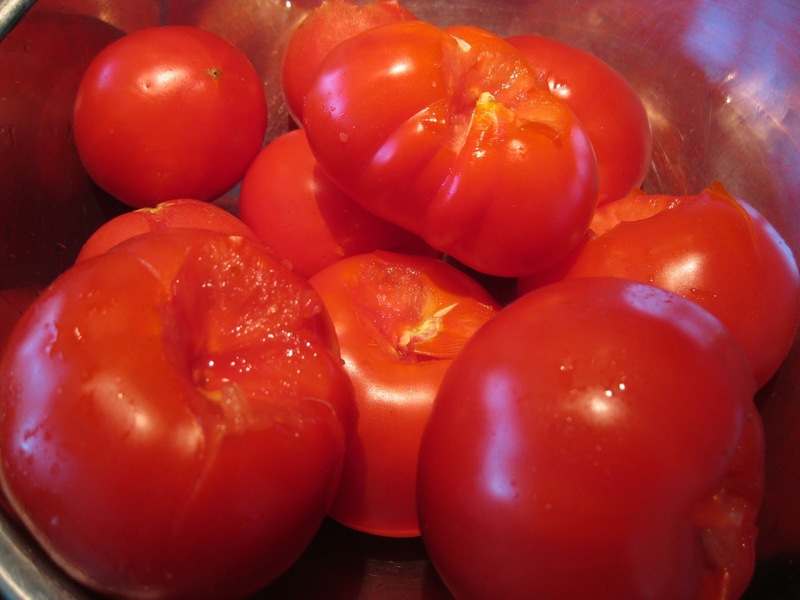 Once all of the tomatoes have been parboiled, peeled, and set aside, use a potato masher to mash into a soup. Heat a large skillet or saucepan over a medium heat. When hot, add the oil then the garlic cloves. Heat the garlic for a few minutes to get color, then pour the tomato soup into the pan. Bring the tomatoes to a boil then lower the heat and allow to simmer for 1-2 hours. 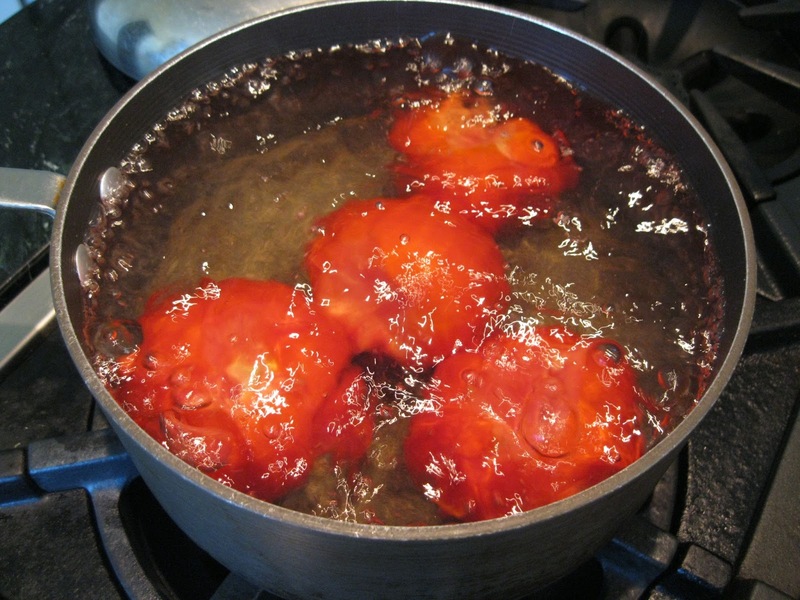 The liquid will reduce considerably over this time so add water a couple of tablespoons at a time to prevent it from drying out, if necessary. You could cover the sauce as it cooks but I find it better to keep it uncovered. 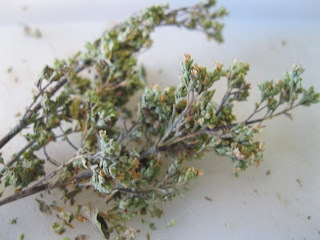 Midway through the cooking time, season with the oregano, salt, and hot pepper to taste. Sauce cooked pasta to use, or refrigerate for a few days, or freeze for a few weeks before using. Living in the flats in the East Bay, near the Bay and west of the Berkeley Hills, my garden doesn't get all that much heat during the summer. I can't complain that we rarely experience the typical 90F degree climate of the eastern part of the county but this does make it tricky to grow the warm temperature vegetables like eggplant, peppers, and melons. Last year, though, I took a chance on planting an Italian frying pepper and a Padrón pepper and got lucky in that they both did quite well. This gave me the confidence to try a few more of each this year and again I've gotten a good yield. One of the treats I remember in growing up on Long Island were fried peppers cooked by Italian grandmothers in my neighborhood using peppers they harvested from home gardens and wanted to recreate it myself. I got the idea for this recipe from the video site Laura in the Kitchen, substituting the bell peppers she uses with the frying peppers from my garden. 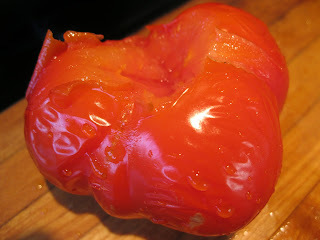 This is a very simple dish and absolutely beyond delicious when using peppers either right from the plant or from a good source at a farmer's market when in season. Remove the stems and seeds from the peppers and slice lengthwise into thin strips. Heat a large skillet over medium-high heat and add the olive oil. 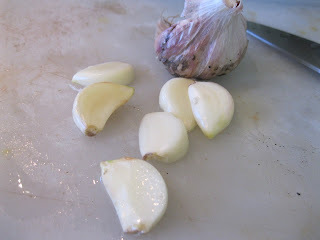 Once the oil is hot, add the garlic cloves. 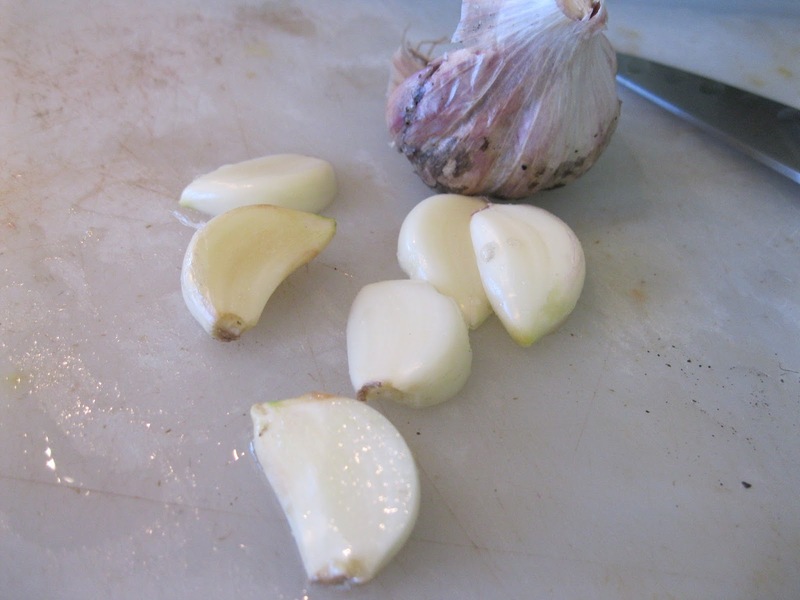 Once the garlic has gotten a good color add the pepper slices. Let the peppers get a good color (about 5 minutes) then reduce the heat to low. 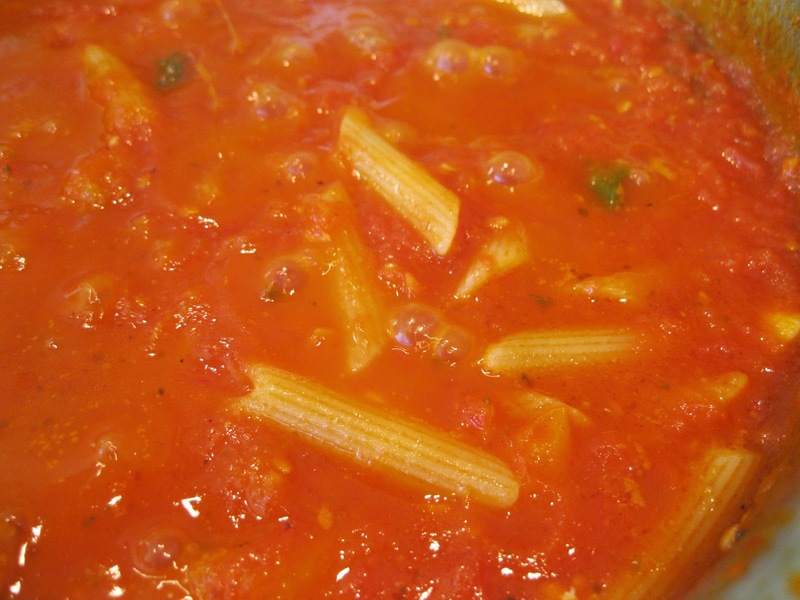 Allow to cook for about 30 minutes, stirring them occasionally to distribute the heat evenly. I've followed Eric Ripert for several years now - first on a PBS cooking show, Avec Eric, that he hosted for a while, then on cameos he would make on various shows hosted by his good friend Anthony Bourdain. My wife and I were able to make a pilgrimage to his restaurant in Midtown Manhattan a couple of years ago, Le Bernardin, where we were completely blown away by the seafood tasting menu they featured. I won't go into detail here about that incredible meal but suffice to say it was definitely in the top 3 of places we've been to. My wife recently caught a segment on the Today show with Eric demonstrating this recipe and suggested that I check it out. Since we're now entering the height of the tomato harvest in our backyard garden, anything that features tomato is fair game in the kitchen and this recipe certainly qualifies. As usual, I've modified the printed recipe to describe how I cooked the dish. Place the extra virgin olive oil in a mixing bowl then add the shallot, parsley, tarragon, basil, capers and olives. 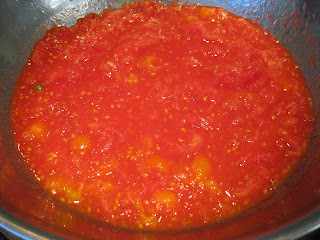 Stir to combine the ingredients and transfer to a small container. The sauce can be made a couple hours ahead and kept at room temperature. Prepare the plates just before cooking the fish by fanning the sliced tomatoes in a circle in the center of four plates and season lightly with salt and white pepper. Place a large sauté pan on medium-low heat and add the water, the oil and lemon juice. Lightly season the liquid with salt and white pepper. Season the slices of halibut on both sides with salt and white pepper and place in a single layer in the warmed poaching liquid. The liquid should come about halfway up the fish, adjust if needed with more. Cook the fish for about 2-3 minutes, then flip the slices and cook on the other side until they are just warmed in the center. Eric used a toothpick to pierce the center of one of the fillets and determined if it was done by whether the toothpick was warm or not when he removed it. Place two slices of the poached halibut in the center of each plate on top of the tomatoes. Finish the sauce with the fresh lemon juice and spoon over the fish and plate, garnish each dish with the torn basil and serve immediately. This week Siren SeaSA came through with a drop of king salmon fillet as well as several recommended recipes. I've copied the recipe verbatim from their blog however noted the modifications I made and the alternate ingredients I used in italic below. Start the aioli first. Put egg yolks in a food processor with garlic, anchovies, Dijon mustard and parsley and puree on high until egg yolks turn from dark to very light yellow and double in volume. Slowly start to add oil, a few drops at a time to emulsify. Work quickly to avoid aioli from over heating. Continue to add oil until mixture thickens. If aioli gets too thick so oil is not incorporating, add a few drops of ice water to loosen. When all oil is incorporated, season with lemon juice, Tobasco and Worcestershire sauce. Refrigerate until ready to use. This can be done up to 24 hours before use. Heat grill and season slices of sourdough and zucchini with olive oil, salt and pepper. Grill until bread is bread is slightly toasted and zucchini is slightly browned. Take off grill and cool. When cool, dice bread into inch cubes and zucchini into half-inch cubes. Toss bread and zucchini with arugula, julienned red onion, avocado and red wine vinegar and olive oil. Season salad with salt and pepper to taste. Heat sauté pan over high heat. When hot, add enough olive oil to coat the pan. Pat the salmon dry with a paper towel and season skin side with salt and pepper. When the oil is hot and slightly smoking, add salmon, skin-side first. It should sizzle and not stick to the pan. Immediately turn the heat down to medium-low and crisp the skin. When skin is crispy and salmon is half cooked, season the flesh side with salt and pepper and turn salmon over to finish cooking to medium-rare. When salmon is medium-rare, remove from pan. Place bread salad on plate, place salmon on top, and drizzle with parsley anchovy aioli. Enjoy with a nice Rosé. Another take on a recipe from one of my main sources for recipes, Patricia Wells' Trattoria. This is a simple yet delicious idea for a weeknight dinner if you can stop by a fishmonger on the way home from work for some good quality shrimp. For this recipe, I peeled the shrimp but left the tails on. Then I used a paring knife to just barely slice down enough to remove the 'veins'. Rinse the shrimp then allow to dry on paper towels. While the pasta is cooking, in a large skillet, heat the oil over a medium-high heat. Once the oil is hot but not yet smoking, add the minced garlic, thyme, red peppers, then the shrimps. Toss the coat everything with the oil and let the shrimps cook just past turning color then turn each one to complete cooking on the other side. This should only take about 1-2 minutes per side. You want to just barely cook the shrimp as it is too easy to overcook them. Remove the shrimp and set aside. 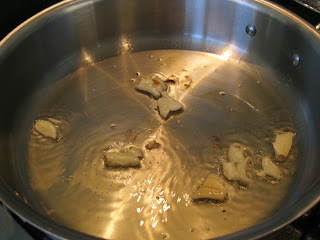 Add a touch of the pasta water to the pan in order to loosen up the fond. Once the pasta is done, drain it in a colander then add to the pan, adding about a half cup more of the pasta water. Let the pasta cook for another minute while the water reduces completely leaving only the oil. Add the shrimp back in, sprinkle the chopped parsley on top, stir to combine everything while heating through, and serve immediately drizzling a bit more olive oil if you want.